Unbelievable offers from DBS Debit card - Too good to be true?? Unbelievable offers from DBS Debit card – Too good to be true?? I got a mail with the below link. I even called up DBS bank and they say exactly the same.. Is there something i am missing? Is this a credible bank? Should I open an account to get the below benefits? Cost of holding the account is minimum of Rs. 50000 * 5.6% or 2800 p.a. or Rs. 233 p.m.
Whatever you save is minus of Rs. 233 cost of interest. Glad to know that SumitTalwar ..
As mentioned in the PDF the net cash back is 5% only (remaining 2.5% is waiver of surcharges). Also to get maximum benefit of 1000/- Cash back the total monthly spend must be 20000/- which practically nobody will do. On an average if you are spending 5ooo/- monthly on petrol you will get Rs 250 as cash back. Dear Kartik, please check below for fuel surcharge waiver and cashflow. Regarding PVR tickets, it’s of no use as it’s valid till 31st March 2014 only. Written clearly here. Yes, I read the detailed T&C for fuel too. Max of 1000 per month cashback allowed ( which sounds still very good.). Even the fuel surcharge doc says 31-Mar.. I still think no Credit card as of today matches the offer ( if they do renew these next month). Since I have never heard of this bank nor seen the ATMs, i as worried if its fraud or something.. But seeing all the replies here, I feel nothing to question the credibility of bank.. Its just that I have to take a call based on the detailed T&C if it really suits me.. Yes, I read it.. I even put that in my very first post ( in brackets 🙂 ) I agree this is beneficial as it will lure me into going but when compared to other banks, combined offer from a debit (not credit) card looked very suspicious. None of the other banks allow unlimited ATM withdrawals from ANY outlet for no charges. Especially the 5% cash-back on any SWIPE on any machine at any store and 7.5% cash back on few outlet.. I don’t see any card coming even close to this..
One strong negative point is that it says these offers only exist till 31-March. I am not sure if its just ending on that day or will get renewed for another year.. So, even if I decide to open an account, it will be after Apr 1 after seeing fresh T&C. Dear Kartik, please read the fine print of the offer. Like only 4 tickets are available under PVR offer. Now this offer is really beneficial as you are lured to spend on movie tickets? Only you can decide. I think the link is genuine only. Generally charges for normal debit card are around Rs. 120 per year from any bank. There is a similar card from ICICI called ICICI Coral Debit Card for which they charge Rs.500 + taxes per year. This DBS card might come under such category. So, better clarify about the charges on the card clearly (from DBS website) before you go for it. DBS is an international bank, so you might not worry about the credibility of the bank. Thanks for the reply Hemanth.. I have Axis, SBI, ICICI and HDFC debit cards and none of the charge any money per year.. I am not sure which context you said Rs 120 is charged. I thought ICICI Coral Credit card has Rs 500 per year.. In any case, the offers claimed by DBS is very surprising. ICICI coral, for example gives 2.5% waiver that too only in HP petrol outlets.. But DBS is ging 7.5% ( including 2.5% waiver) at ANY outlet. I did clarify on call center and they told the same thing. In-fact, apart from the above two offers, for a savings plus account ( min bal of 10K quarterly avg), they give 5% cash back on ANY transaction done at any place as long as the card is swiped in a machine. Movies, Restaurants, Grocery, ANYTHING.. I cannot see any other banks ( Debit , not even paid CREDIT cards) come anywhere close to this kind of offer.. Hence I got the doubt.!! Yes, i will have a look at hard copy of the letter having all offers and only then proceed. But wanted to know here from experts if they have had some bad experience with this bank or have I missed to notice some hidden clause!! I believe there must be some kind of “maximum limit” on waiver like only upto Rs 499 or something like this , Did you confirm this part ? Yes Manish, It has a limit of Rs 500 per month for the savings plus account. 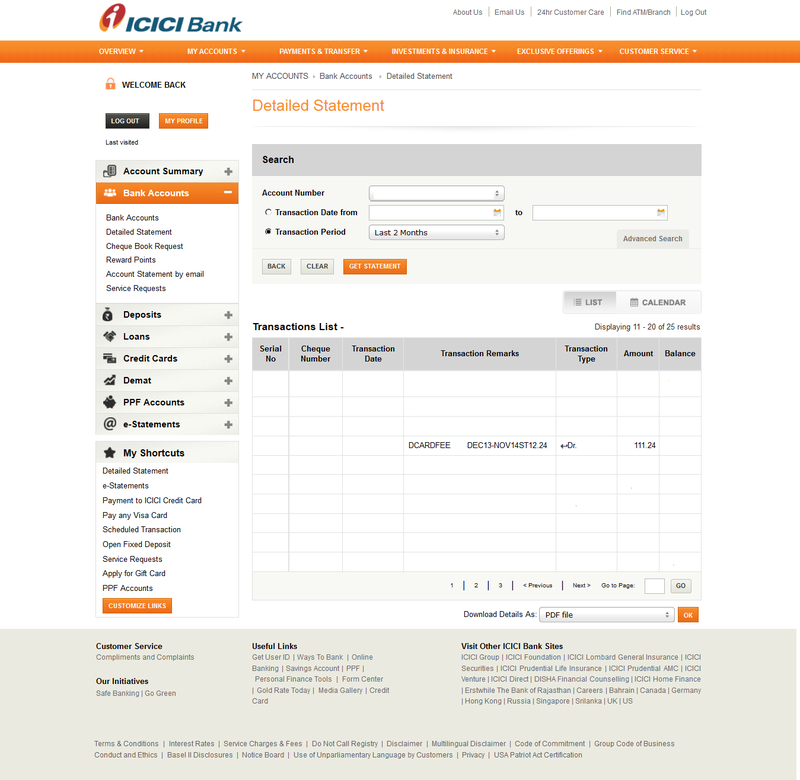 Are you sure that ICICI Bank does not charge any money per year? I checked transaction for one full year 1 Jan 2013 to 1 Jan 2014.. I don’t see any deductions at all.. I only use the netbanking.. I don’t use it to Swipe it anywhere. Is that the reason? Rs. 120 I am talking about is the debit card charges, that are charged by any bank every year. If there are no such charges means you might be having some premier/salary/special accounts with the banks. Generally for a normal(basic) savings account at a PSB/Private Bank, this charge is there. and if you click the parent url from your link, it shows page under construction. May be phising site. You may want to double check with the url and phone numbers from the link i shared.